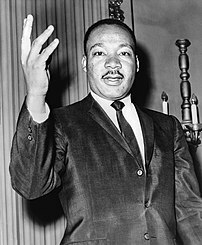 Thorswitch has an excellent post on Dr. King’s vision for a black president that aired on the BBC. Dr. Martin Luther King Jr. predicted the United States would have a black president, but his timing was a bit off. He saw the milestone coming a lot sooner. You can see a clip of King’s prediction on “BBC World News America ” at 7 tonight. I’m finding myself, tonight, feeling like I’m holding my breath. There’s no doubt that there are any number of miscreants and – to borrow a phrase – “evildoers” who do not want to see “President Obama” become a reality, and while I don’t think anything will actually happen, there’s still a part of me that’s concerned that someone may try to disrupt the proceedings or – worse – assassinate Obama. It’s a bit like it was when the calendar changed over to 2000 – so much worry over whether the computers of the world would keep working or not, yet when the day came – I think largely due to the fact that there’d been so much concern expressed about the possible problems and people took the time to try to prevent them – really, nothing happened. And that was pretty much what I expected – I had a bit of doubt, but no serious worries that anything major would go wrong. I seem to be in much of the same mindframe for tomorrow – that the knowledge that someone, somewhere is going to at the very least WANT to try something – will have prompted the Secret Service, FBI, DC police and/or whomever else might be of assistance to have the absolute best security plan in place and have been working to track down any threats they may have become aware of – so that when the time comes, our new President will be safe, the inauguration will happen without trouble, and we can finally start moving out of the shadow we’ve been under for the last 8 years. Tonight, though, all I can do is ask that Odin, Thor, Frejya, Tyr and the rest of the Aesir and Vanir will place Obama under their protection, give him the strength, the wisdom and the sense of justice he’ll need in the coming years, to be the great leader he has the potential to be. A small part of me was holding my breath as well. But now we have witnessed a historical moment that’s for sure. And without any kooks trying to turn over the apple cart. That being said, my fear is what’s to come. I say that not in terms of fearing the actions of some group of sad mouth breathers or a lone jackball, but more or the media. I wonder if the expectations are set too high. And if he fails to live up to someone else’s expectations, will there be a fall from grace. Only time will tell. Oh and nice shout out to the Asgardians.